Island Gems members with Oualichi Women’s Soccer Association representatives and young soccer club players. Island Gems Charity Foundation has financed the transportation for the second annual Oualichi Women’s Soccer Association’s Girls Summer Soccer Camp. The three-day camp starts on Thursday. The camp is not all about soccer. Girls will be taught essentials of team building and boosting self-esteem; skills useful on the pitch and in everyday life. Two women coaches from the United States Hannah O’Brien and Meredith Aird will conduct the soccer camp. O’Brien and Aird are players for the Connecticut Southeast Premier Team. Girls, who will attend the camp free of cost, will be taught practical soccer skills in the morning at Raoul Illidge Sports Complex in Cay Hill. They will be taken to fun activities – island tours and boat trips – in the afternoon by the camp organisers. 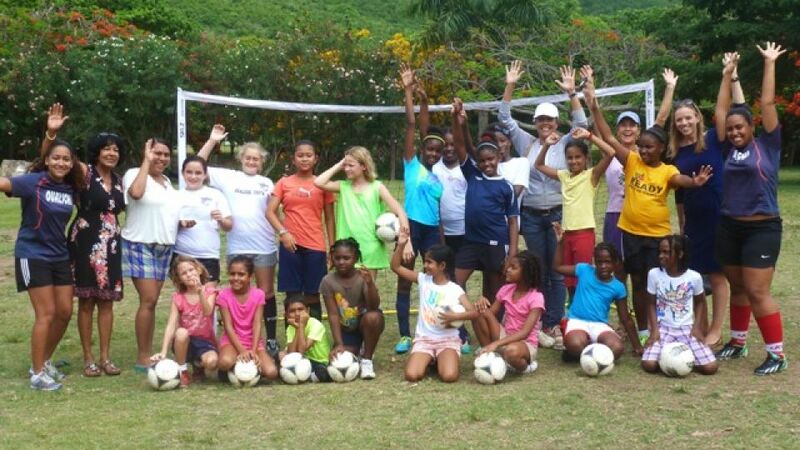 Island Gems, an all-women group, was happy to assist with the camp when the soccer association requested a donation. The cheque was presented by Island Gems to Oualichi representatives at a recent Saturday morning youth team practice session in Emilio Wilson Historical and Cultural Park. Oualichi Women’s representative Danaë Daal gave Singh, Gems Vice President Karine Fleming, board member Jody Rosen, member Asha Stevens and Kim Huisman a rundown of the team practice, the plans for the summer camp. She thanked the Gems for supporting the camp. Island Gems does not give cash to any organisation. It either pays a vendor directly for the services required for the group or purchases the needed equipment. Funded used to assist the summer camp was raised by the foundation at its annual costume dinner held in April.